Even though we love doing a whole roast turkey, that can be a bit impractical given that Thanksgiving dinner is often just the two of us. So we are always looking for alternatives. A few years ago we came up with the idea of stuffing a turkey leg instead of the whole bird. 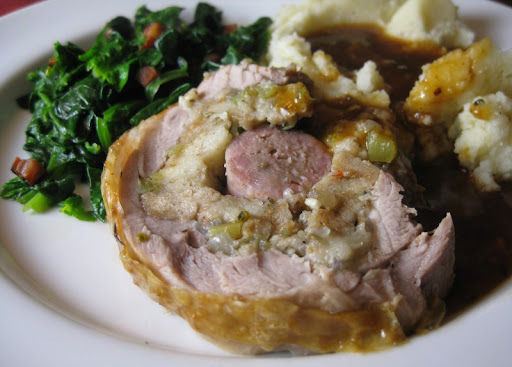 It is a great way to get all those Thanksgiving flavors in a manageable, easy to cook package. It all starts with a whole turkey leg with thigh attached. You should be able to buy individual legs from your butcher if you ask, or you can do what we did and cut one off a whole bird and use the rest for another purpose. Boning the leg is pretty straight forward as long as you take your time. The thighbone is easily removed by running your knife along its edges until you can slice underneath. Then, keep moving toward the leg, cutting around the large knee joint and splitting the skin and meat down toward and around the ankle. Be sure to pull out the hard tendon pieces along with the bone in the leg section. 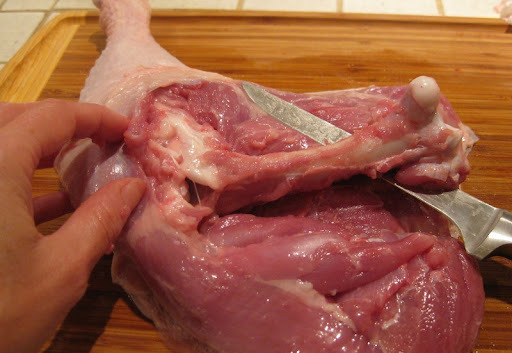 Once the bones are out, make a few strategic cuts to even out the thickness, and place a few stray pieces of meat into the hole where that big knee joint was (you'll see). 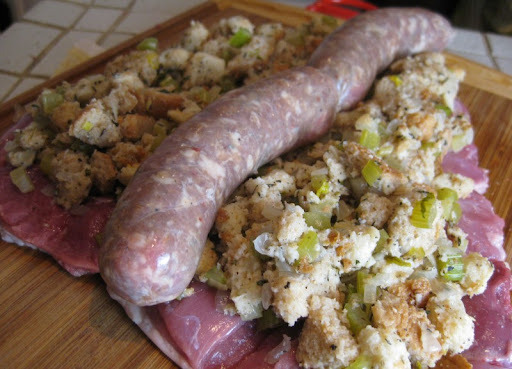 Make up a small batch of your favorite stuffing recipe - every Thanksgiving cook has one, and yours is likely different than ours - and spread it over the flattened leg meat. You can stop here, but we like to gild the lily a bit by adding a few sausage links in the middle (this time we used homemade Italian sausages). Then it is time to roll it up and truss it. 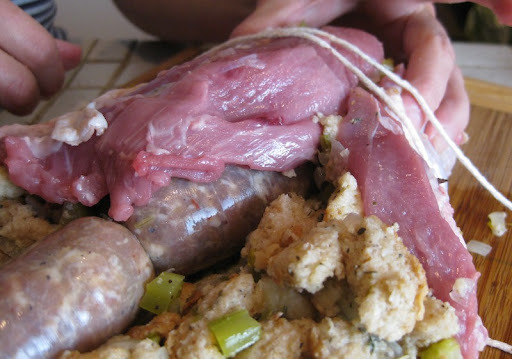 Cut several lengths of kitchen twine and slide them under the flattened meat. 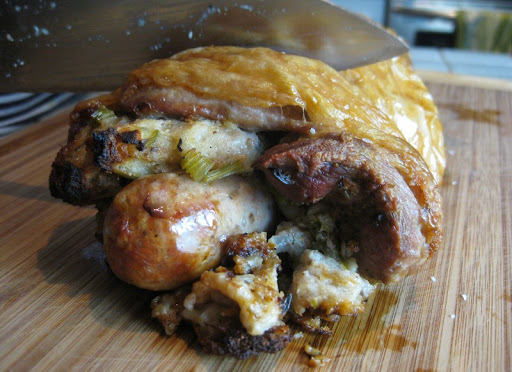 Starting at the wide end, carefully pull up the meat and fold it around the sausage and stuffing, then tie it closed with the twine. Keep moving toward the skinny end and repeat using 4 or 5 pieces of string. You may find that you can't fully enclose the stuffing at the ankle, but that's ok, it'll be fine when you flip it over. After a brief 50-55 minutes in a 425°F oven, it comes out as a golden package completely encased in crispy skin. Slicing it into rounds makes serving it really simple and fun. 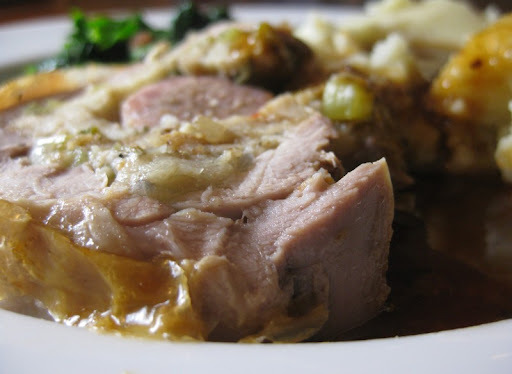 The thigh meat ends up nice and juicy, but that doesn't mean a bit of gravy isn't still absolutely called for. You can start with a simple chicken stock gravy, but be sure to use the crunchy bits and drippings from the cooking pan to enhance and deepen the flavor. In addition to the required mashed potatoes, we also did a side dish of sautéed spinach with bits of bacon. And what of the turkey breast, you might ask? As I am writing this, half of it is on the smoker (along with the wings), and the other half is curing for a batch of turkey pastrami. Whoa...I'm really diggin' this and yes...I'd have turkey again this year! Oh wow. I'm not a huge fan of turkey, but this looks delicious! wow...that is one meaty package....hope you had a good thanksgiving! how did you make your gravy get that brown color? was it also because of the drippings from the sausage? That looks amazing!!! And have to try it sometime. Thanks Jessie, It's all about the stuffing! And the sausage doesn't hurt either. Thanks Jason. You should definitely give it a shot! 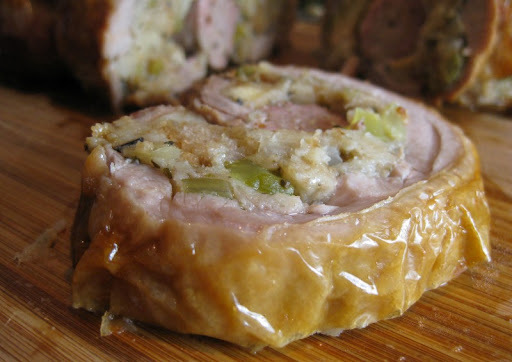 My wife likes wild rice stuffing and and I like traditional sausage bread and gizzard stuffing. This year I wanted my stuffing to taste like it was cooked in the bird. Your recipe did the trick. 5 thumbs up. Plus I love the dark meat more than the white so this year I have 2 extra legs. Next year I'll have four. Also your pictures are very good, my hat is off to you. Thanks, Ken - glad you enjoyed it! can u freeze the stuffed leg? thaw and cook? We haven't done it, but I'm sure the package can be frozen for cooking later. 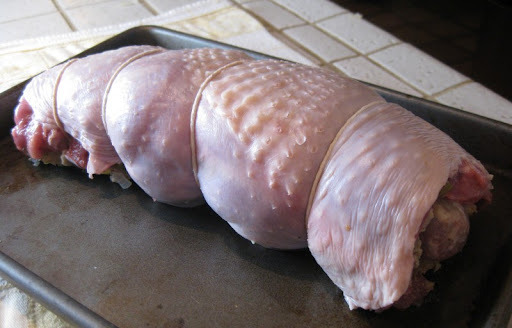 Just be sure your stuffing is cool or cold before rolling it up in the leg meat, and then pop it into the freezer right away. Thaw in the fridge like any other roast and you'll be good to go! Great. 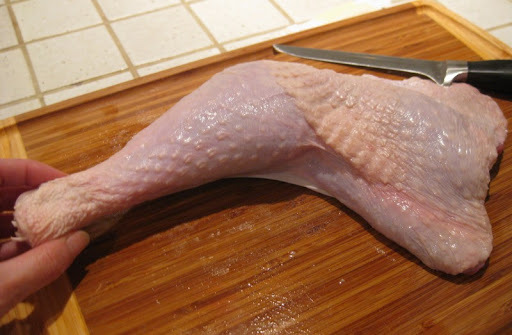 To make tying the leg easier; roll it in saran wrap and then freeze for a few hours. Remove the wrap and tie up the frozen meat. Allow to thaw and cook. This will also give it a better finished shape.